There are many benefits to online engagement: it is accessible 24/7, cost efficient, environmentally-friendly, and has the potential to reach a greater audience than the “usual suspects” who turn up to town hall meetings. Whether you’re pursuing online public engagement to complement existing strategies, or to replace in-person consultations, here are 6 tips to make your transition painless and effective. 1. Select the right public consultation platform. Not all consultation platforms are created equal. Too many organizations believe that online consultation is simply hosting an anonymous survey or using a forum where anyone with an email can register. In reality it is essential to understand that your choice of platform will impact your consultation’s legitimacy, the quality of feedback and ultimately whether you can defend the decisions made based on the data collected. The platform will be more than a simple tool and needs to incorporate the key principles that go into making an online engagement successful. 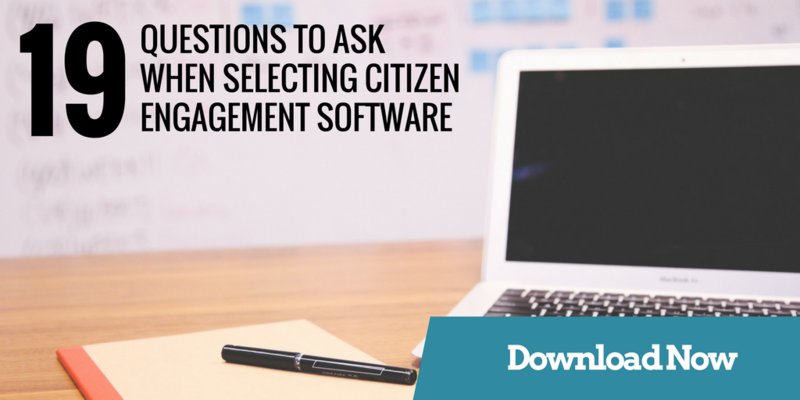 Our post on the 8 factors to consider when choosing online community engagement software is essential reading for anyone who wants to fully understand the key criteria to consider when making their choice. In this guide we look at how your platform should help with creating legitimacy, maximising participation and the importance of the network effect. We have also created a 19 point check-list to make researching a little easier. 2. Put yourself in the shoes of your target audience. It’s important to resist the “if we build it, they will come” frame of mind when it comes to online public consultation (and civic tech in general). People are busy. They care about local issues, but at the end of the day they still need to make dinner. Ask yourself: What is the topic and scope of your consultation? Is the information you’re presenting relevant to your target audience? Why should they care about your issue or campaign? In short, what’s in it for them? Be specific in your outreach, explain why the consultation is important and the impact that they will have on the outcome. 3. Spend time on your communications and outreach strategy. A consultation will only be successful if people are aware of it. However, we live in an information-saturated world. According to Positioning the Battle for Your Mind, the average brain is exposed to 3,000 ad messages per day. The response to information overload is often to simply tune out and not engage at all. Many non-profits, community organizations and civic groups don’t have a large budget for advertising or marketing. We’ve put together a list of 5 practical social media strategies to help maximize your online reach. 4. Be transparent and manage expectations. Many residents feel that the government is out of touch with their concerns and do not feel that their input will be listened to, or even seen. They feel that consultation is just for show, not to make real change. Consultation research has stressed the need for transparency on the part of proponents in order to develop trust. Do your homework: get to know the community and understand their concerns, and manage expectations by being clear about what is and isn’t up for debate. 5. Reduce barriers to participation. Public participation can involve long, intense discussions of difficult policy matters that often uses technical language and terms that may be unfamiliar to residents. People with low levels of literacy, or who speak another primary language, are at a disadvantage. Ensure the language you use is as simple and straightforward as possible. Use short sentences and short words. If you must use technical jargon, include an easily accessible glossary of terms. Images and videos are significantly easier for people to understand than text. The shift to online facilitates the sharing of multimedia which can increase accessibility, e.g. videos, photos, diagrams, podcasts, and more. 6. Engage in dialogue with participants. The majority of participants are lurkers — they may follow and visit your consultation topic page, but choose not to participate. Facilitate increased engagement by appointing moderators to guide discussion forums and prompt responses, or provide clarification when needed. Be sure to provide the necessary support that participants need in order to be involved effectively (e.g. tutorials, help options, stringent moderation policy, etc.) This can help engage a broader spectrum of participants.